Village Farms reported 2018 Q4 results on March 13, which showed initial cannabis sales in Canada through its Pure Sunfarms JV. The company also announced a U.S. hemp JV with a local farming group to develop hemp cultivation and extraction business. After staging one of the best performances among cannabis stocks in 2019 so far, we think the market has already priced in most of the potential upside for VFF. Welcome to our Cannabis Earnings series, where we break down the latest earnings to help you focus on the most important topics. Village Farms International (VFF) has been one of the best-performing stocks in the cannabis industry since it embarked on a meteoric rise in 2019. The stock has gained >300% in 2019 so far, making it one of the best among the large and mid-cap stocks in Canada. While we appreciate the progress it has made in building one of Canada's largest cannabis cultivation facilities, we think the rally might have gone a little too far, considering the risks that remain within the business. We will discuss Village Farms' latest quarter and share our outlook for this high-flying cannabis stock. On March 13, Village Farms reported its 2018 Q4 and full-year results. While the company has been one of the hottest cannabis stocks, its cannabis business actually remains in the early stage, with the vast majority of its revenue still coming from selling vegetable and other fresh produce. During Q4, VFF reported $38.8 million in sales, which is a slight increase from the same period last year. Due to its 50% ownership in the cannabis JV, Pure Sunfarms, the company does not consolidate financials from the cannabis business and instead uses equity method accounting. VFF disclosed that the cannabis JV generated $3.8 million of sales during the last quarter largely from sales to the wholesale legal market. In Canada, some LPs have struggled to ramp up production in the early days of legalization, which resulted in significant demand for wholesale cannabis. VFF also did not have its own supply agreements with the provinces (it has since won its first contract with Ontario pending receiving its processing and sale licenses). While the cannabis JV was a small contributor in Q4, there are high hopes that it could ramp up significantly in the next few quarters now that the entire facility is fully licensed for cultivation. The company has not been able to sell to Ontario because it still needs to obtain processing and sale license from Health Canada, but it does expect 2019 total production to reach 50,000 kg, a respectable number compared to most LPs in Canada. After all these, it is important to keep in mind that VFF only holds 50% interest in the Pure Sunfarms JV, which means huge leakages from a value accretion perspective. The JV partner, Emerald Health Therapeutics (OTCQX:EMHTF) is another big beneficiary of the JV, but that stock has not risen nearly as much as VFF did. 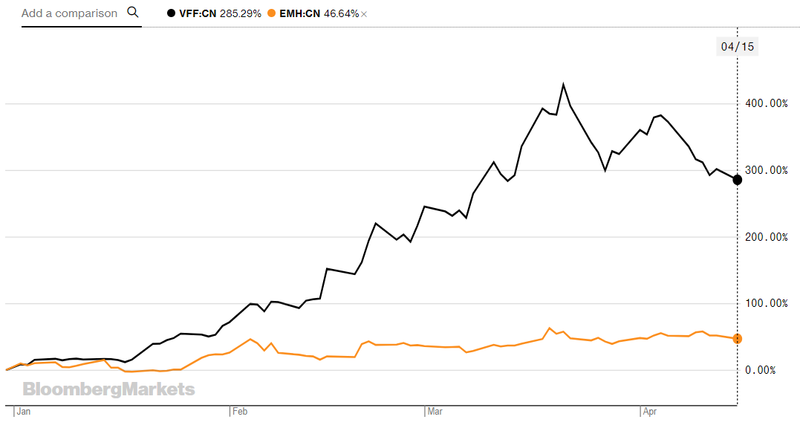 In fact, Emerald has only risen 46% in 2019 so far compared to 285% at VFF. 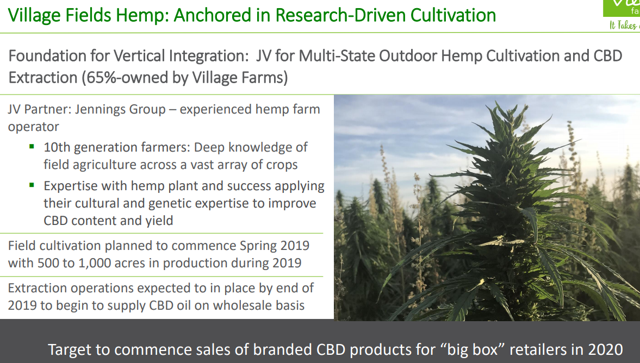 While it is impossible to explain the different performances of the two stocks, we think VFF has benefited immensely from its expansion into the U.S. hemp sector as we will discuss below. On March 1, VFF announced that it has formed a joint venture with farming group Jennings Group to build out multi-state outdoor hemp cultivation and CBD extraction operation in the U.S. This marks a significant step forward for VFF as it targets one of the largest cannabis opportunities in the U.S., following the passage of the 2018 Farm Bill. The company is targeting 500 to 1,000 acres of hemp to be planted during 2019 and, importantly, it is also building an in-house extraction facility which will supply CBD oil to wholesalers with an eventual goal of offering branded CBD products to retailers. We have seen rapid developments in the U.S. hemp industry, including recent announcements from CVS (NYSE:CVS) and Walgreens (NASDAQ:WBA) to carry CBD products that are compliant with FDA regulations. A number of companies are already actively capturing market share in this fast-growing sector, including category leaders like Charlotte's Web (OTCQX:CWBHF) and emerging players like Curaleaf (OTCPK:CURLF). Given VFF's timeline of product launches the soonest in 2020, we think there will be a tough battle for the company to break into the market. Growing hemp is not a complicated agricultural endeavor, and we expect VFF to have little differentiation from the thousands of other farmers in the U.S. that are likely to turn their attention to this nascent industry. In our view, the most important things for the U.S. hemp industry going forward are brands, costs, quality, and distribution channels. Village Farms gained $475 to $620 million of market value in 2019 so far, mostly driven by its progress in Canada and the recent announcement to enter the U.S. hemp industry. However, it is important to keep in mind that VFF only owns 50% of the Pure Sunfarms JV in Canada and 65% of the Village Fields JV in the U.S., which would significantly limit value attributable to it. The question now becomes whether the additional value creation is justifiable based on the recent developments and progress at the company. To us, we think the answer is somewhere in the middle. VFF certainly deserves credit for its achievements, including fully licensing its 1.1 million sq ft facility, which is one of the fastest in the industry. Its foray into the U.S. hemp industry also has the potential to deliver superior returns over time despite the significant execution risks involved. However, given VFF's lack of control at the Canadian cannabis JV and the preliminary nature of its U.S. business, we think it is prudent to assign certain discounts to the valuation of its cannabis business which would lead us to believe the recent share price movements have been excessive. For example, assuming no value for the U.S. hemp business, the market has valued VFF's cannabis JV in Canada at $1 billion to $1.2 billion on a 100% basis, which is very rich, considering some of the best mid-cap names are only trading at that range such as CannTrust (CTST) and OrganiGram (OTCQX:OGRMF). As a result, we think the market has fully valued VFF shares, and there are high risks of correction, given now the narrative shifts to its execution in both Canada and the U.S. over the next few quarters.